This is the story of the lives of migrants, legal and illegal. Randeep, Avtar and Tochi live in a house in Sheffield. It shows the reasons why they made the trip to the UK – lack of money, lack of work, poor harvests, the precariousness of life in the face of mounting debt, parents and siblings to support back home (Avtar) , or after their violent caste provoked deaths (Tochi). The routes taken – selling kidneys, taking out loans to pay for student visas, loans to secure the family’s business in times of economic stress, the arranged marriage-visa route and the “back of a lorry” route. Randeep’s visa wife is Narindar a highly religious British Sikh, who has chosen this route, against family honour and community values, to help where once she could not, to now do what she considers “the right thing”. This is their story over the course of a year when their 4 lives are flung together. They struggle to find work with their “fauji” status, even with student visa, a marriage visa, there is a fine line of difference between them and Tochi’s fully illegal status. They have to keep their money as cash, sending most of it back home, as regular, and as much as possible, balancing the need for this, with the demands of the loan sharks UK agents, with eating, surviving on roti and sabzi fo rthe most part. They are easy prey to the unscrupulous gang masters, shop and restaurant owners who pay them a pittance for long hours of work in terrible conditions, never mind those who steal their passports and lock them up at night between workdays. Its a grim but realistic account of a life most of us are comfortably ignorant of. 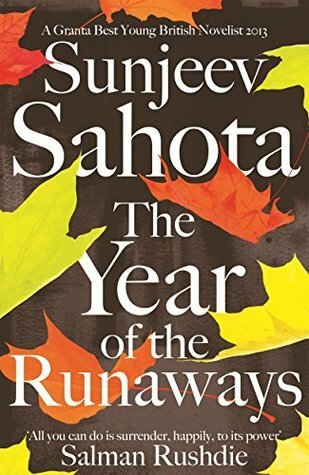 Sahota captures very well the characters, their plight, their hopes and fears, their brotherly love, their isolation, their moments of tenderness and humanity, of brutality and survival. ashramblings verdict 4* and a very just 2015 Booker shortlisting. The audio version is read brilliantly read by Sartaj Garewal giving the Hindi vernacular an authentic ring, thereby helping readers not used to the sounds, intonations, or vocabularly, the integratiion of which, in my opinion, Sahota handles really well removing the need for a glossary.